How many of the PBUs/PFOs do your team analyse on your production/injection wells? “Just enough. We spot the shut-ins that are more than 10 hrs, analyse them, and review every quarter with the subsurface and operations team.” (well done). “We analyse the pressure data for each well, as soon as a PBU test is available. We share with the subsurface team and give feedback to the operations folks onshore and offshore. We are pro-active in our surveillance and well management” (are you for real ? kudos… and you probably end up with lower decline and higher recovery factor…). You may have deduced that most of the time, the answers we have are between the first and second ones. We think it is because of two main reasons: a lack of resources and a lack of expertise. Derivative, superposition time, deconvolution are not very nice words to hear and may remind us of some complex maths we took some time ago. Let’s face it: well test analysis on PBU tests is not too popular. Nowadays, most of the production and injection wells are completed with permanent downhole gauges and pressure data close to the perforations are available to the production and reservoir engineers. Lots of them. Every time there is an operational upset, a maintenance or a well work that requires the wells to be shut-in, pressure build-up and pressure fall-off tests are acquired in the production and injection wells. These are called “opportunistic” PBU/PFO tests. For a new well, a baseline PBU test should be planned in the first two weeks of production to obtain the initial performance and reservoir pressure. Then, during the life of the well, it is fair to say that about 95% of the PBU tests will be opportunistic. These free data contain information about the well and the reservoir over time. They represent a series of snapshots of the well and reservoir performance. The well test analyst can extract this information so as to monitor production, detect and understand any performance deviation. New learning can be made and the development plan can be optimized. This will help to protect the base oil and gas production and to optimize any new well delivery. Is your well and reservoir still healthy or starting to show some symptoms? All of this without doing any detailed analysis, just by looking at the plot. Derivative overlay with deconvolution in red. The well test analyst can then detect and diagnose a production problem and more importantly take action before it becomes irreversible. This could lead to well management strategies and treatments that maximize the well’s production life and increase the recovery factor. The derivative overlay could also be used to detect the water front and predict water breakthrough a couple of months in advance. This can help the production team to be more prepared, choking back to avoid sand production, taking samples and starting the tracer sampling programme if tracers were injected into water injection wells. After the water breakthrough, the opportunistic PBUs could be used to obtain the field-derived relative permeability curves. For water injectors, this technique will help to ensure no excessive fracture growth, detect fracture damage and assess the impact of water quality and temperature when injecting produced water. Damage in the fracture could increase over time with the accumulation of debris, oil-in-water contents, etc…, plugging the perforations and closing the fractures. One way to assess the production and injection strategy is to review the evolution of reservoir pressure and well performance over time. Do your wells have any problem with pressure support? With too much work to do, it is tempting for the reservoir engineer to assume the gauge pressure at the end of the PBU or after a certain shut-in duration to be the reservoir pressure. However, this might not represent the true average reservoir pressure. Average reservoir pressure values are calculated using the MBH method or the superposition plot. Under some assumptions and data handling, the evolution of P* over time could reflect the evolution of reservoir pressure over time. 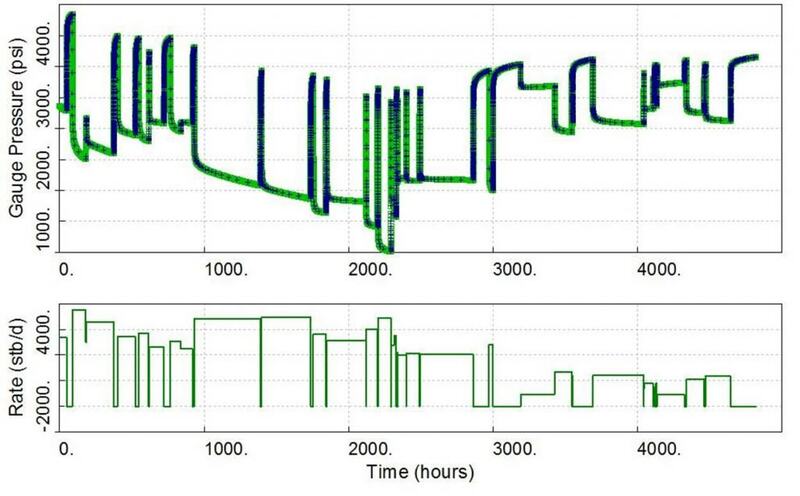 Average reservoir pressure values can be extracted from opportunistic tests and plotted versus time. This can give the team some insight on possible problems with pressure support. To improve the quality of the data, permanent downhole gauges DHG should be located as close as possible to the perforations. Rate should be measured on a monthly basis and quality checked by plotting several PBUs on the same log-log plot. An ops procedure will guarantee some high quality PBU/PFO tests. A surveillance plan that is linked with the development plan should be created and quarterly reviewed with a multi-discipline team. Baseline PBUs should be performed for every new well in the first weeks of production. The results of PBU analysis should then be communicated to the subsurface and ops teams. 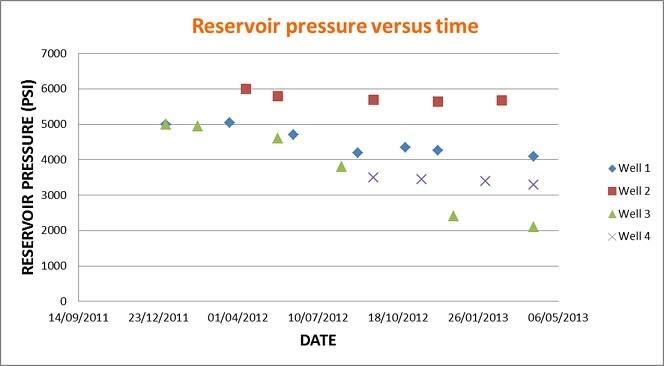 Some monthly dashboards could be created and communicated to all the teams, showing the changes in rate of decline, the latest PBU/PFO interpretation and the evolution of average reservoir pressure over time for each well. Water injectors should receive the same attention because fracture behaviours need to be monitored over time. An excessive frac growth could lead to a fracture out-of-zone or a loss of water containment. Well integrity would then be compromised leading to a well abandonment and a bad reputation for the company. Regarding the lack of expertise and resources, a fit-for-purpose training program could be created. E-learning could help to bring a sustained training in a less disruptive way. A well test specialist could be brought to the team to update all the PBUs and coach the engineers so as to become proactive with PBUs/PFOs. 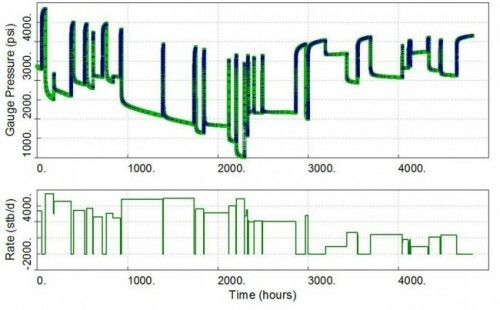 An automated system could also be created to provide a first early quicklook with a derivative overlay for each well, automatically plotting new PBUs. The permeability-thickness KH, skin S and mathematical value P* would then be derived from each new PBU. More complex PBUs could be analysed by the reservoir engineer or the well test specialist. So how many opportunistic shut-ins do your team analyse? Are you being pro-active and looking at the free dynamic data to learn more about your wells and reservoir? For more information or for a discussion on this topic, please don’t hesitate to contact us. Join the Well Testing Group ! Already a member, walk into the library ! Previous Post: Why a pressure gauge near the perforations ?